Nylon Reinforced Vinyl Banners are great for special promotions. Heavy Weight Banners are 13 ounce reinforced fabric with grommets in all corners and every 2-3 feet. These are digitally printed, then hemmed with banner tape. Mesh Banners come with grommets in all corners and every 2-3 feet. These are digitally printed, then hemmed with banner tape. 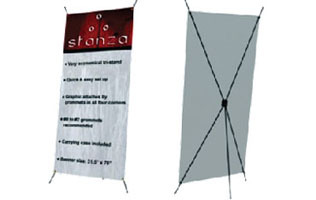 Stanza is a self standing banner complete with lightweight banner stand and hooks on four corners - for indoor use only. 31 inches wide, 70 inches tall. The TriStand Ultimate Banner is a fantastic indoor banner display system complete with grommeted banner. It is very easy to assemble and banner is held in place by a bolt in each corner. Comes with carrying case. Retractable Banner 33" x 78"
Retractable Banner 47" x 78"